About Joanie's Catering, LLC. and the personal catering services they provide. Joan Halter, owner of Joanie's Catering LLC. , is a graduate of the University of Missouri with a B.S. Degree in Food Science. Joan has been in the food service industry for the last 35 years, and is directly responsible for menu planning, food purchasing, food quality and presentation. Joanie's Catering LLC of Hutchinson, MN has served private, corporate, government and charitable clients since 1998! 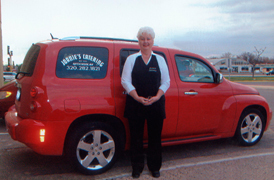 Joan specializes in delivering premier customer service from beginning to end - at a fair value! You can be assured her professional and friendly staff is focused on each and every detail of your event! We are here to create a memorable event at your place or a venue of your choice! We know it is difficult to commit to a caterer if you have never tasted their food. So, we offer you the opportunity to attend a taste testing presentation. That's right, taste our food and decide for yourself. 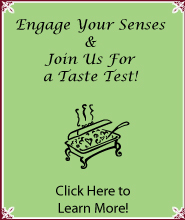 Learn more about our Taste Test Events here! Joanie's Catering LLC. is registered in the CCR (Central Contractor Registration) and PTAC (Procurement Technical Assistance Center) making them eligible to be awarded projects by government agencies. Registered as a Preferred Vendor at the Hutchinson Event Center, the Glencoe Event Center, Redwood Falls Community Center as well as the McLeod County Fairgrounds, Joanie's Catering can help you with your next event at the Hutchinson Event Center, McLeod County Fairgrounds, Redwood Falls Community Center or Glencoe Event Center! Joan holds a FOOD MANAGER CERTIFICATE issued by the State of Minnesota Department of Health. Custom Catering for All Occasions! Joanie's Catering is a full service caterer, committed to both the quality and presentation of your personally designed menu! Joan's crew is ready to handle your event! * A 15% service charge is applied beyond a 20 mile radius of Hutchinson, Minnesota.